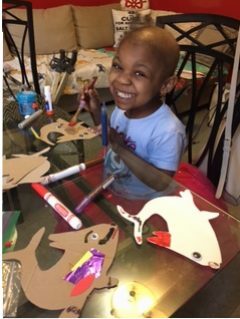 Riprap Friends provides pediatric cancer patients with opportunities to be creative, intellectually stimulated, socially engaged – and happy! Our Friends are currently connecting with children through cooking, cartooning, piano, painting, dance and yoga, and they are also providing uplifting support through activities such as arts & crafts and reading. Flywheel Ride We are teaming up with Flywheel once again to offer a fun and energizing way to give! On Monday, October 23rd, at 10:30am, join dream team instructors Kate Hickl, Jaimie Bailey and Josh Arden at the Flywheel Flatiron studio. Grab a bike HERE and join us for a casual reception after the ride! If you can’t make the ride, please consider sponsoring a bike for a Friend HERE! In order to sustain our work, we need your support. You can DONATE online anytime! What being a Riprap Friend means to you: Being a Riprap Friend means having the golden opportunity to do the greatest work there is–meeting another human being in their own uncertainty, darkness and messiness and sharing our own gifts and joys and laughter in a hope that, through that connection, some of the darkness will dissipate. When I work with Mariah and her family, everything else fades away, and it suddenly crystallizes, with no little certainty, what matters in life. In a city (and career) that revolves around being the quickest, most ambitious, most productive, it is an opportunity to stop time, reach out in a place and capacity I would never have been able to arrange on my own and share an hour and a half of joy, art, magic, play, laughter, creating, singing and healing that stands out in brave contrast to the challenging, painful and unfamiliar circumstances. Seeing a family that is giving, without hesitation, everything they have (in resources, spirit, time and meticulous care) to lift up their child has changed the way I move about the world and has changed what I dream of doing in this life with my time and talents. Your favorite Riprap Friend moment so far: In all honesty, my experience with Mariah and her family has been so meaningful that it’s difficult to put into words. It’s like we’ve all become part of one family. When I get to Mariah’s home, she and her siblings shriek with joy like they’ve just found out they’ve won some insane lottery and can’t believe it. (When, in reality, I feel like I’ve won the lottery becoming connected with Mariah and her family.) At the end of every session, Mariah cries, not wanting me to leave, and we do a special pinky promise that I will definitely be back. Then the whole family (three kids and two parents) have to come do a huge group hug before I can leave. But one of my favorite moments is seeing how Mariah tackles this illness with sass, infectious joy and bravery. Her spirit is unbeatable. Even when she is tired or doesn’t feel very well from the treatments, her love for art and music and connecting and laughing always wins out. I remember giving Mariah and her sister beautiful sparkly pink skirts on the day of the second session. They were thrilled and put them on immediately (and have them on all the time now.) Mariah’s older sister twirled around in hers, laughing, and Mariah sat on my lap because she wasn’t able to walk or really stand because of the treatment. 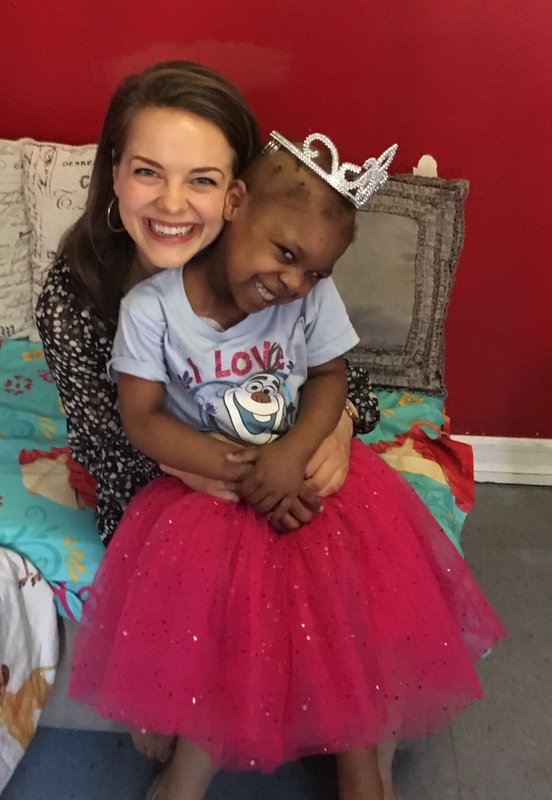 She looked up at me, sighed and said “I wish I could walk.” This week, right around her fourth birthday, she got clearance from the doctor to walk (and dance and run and jump and TWIRL!) Seeing her joy in the healing process and her fierce fighter spirit has been incredible. How did you get into teaching? : I’ve always had a passion for working with children as a music, theater and public speaking teacher through private lessons, performing arts camps, cultural immersions and my time as Distinguished Young Woman of America (I traveled to work with children on how we can become the best versions of ourselves). But, during my junior year at University of Michigan studying Musical Theatre, my work teaching children took a turn. Training for the arts can be a self-centered journey in such an intense program, and I felt this undeniable hunger to reach out beyond myself and use my talents to connect with the community I lived in, and to hopefully bring some light. One day while out for a run, I saw a a young cancer patient in a rose garden outside of Mott Children’s Hospital (our University hospital) whose image I later couldn’t get out of my mind. I contacted the hospital and met with the Family Life Center and Music Therapy coordinators to come up with a way to bring a bit of music, magic and healing to patients and their families. I ended up founding Music at Mott, a weekly outreach program that brought Music Theatre students into the hospital to sing and work with the children and their siblings on a weekly basis. The result went so far beyond anything I imagined–I spent hundreds of hours in that hospital and they were some of the most profoundly moving hours I’ve had. Music at Mott became a University-sanctioned outreach program that is still going strong today!! A PR video created by the hospital went viral, reaching over 3 million people worldwide. You can view it here! (Link: https://www.youtube.com/watch?v=bUCmrePfPM8&t=11s) This is when I realized my specific calling for teaching children battling life-threatening illnesses. Fun fact about yourself: I have climbed the Great Wall of China!